All that’s left now is a little bit of finishing around the edges of the cloth. I may try out some Italian hemming, just for the fun of it. 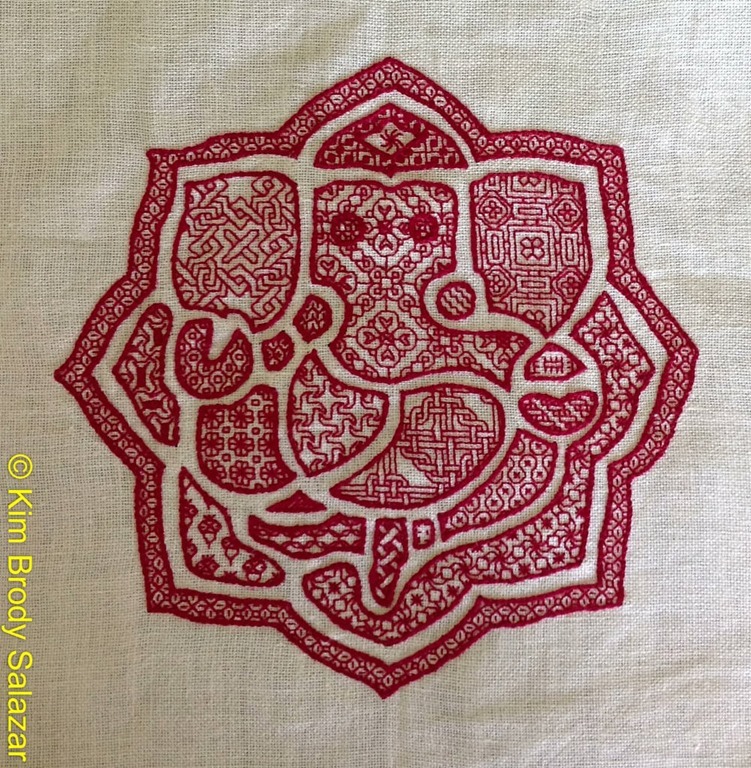 Although I didn’t create this stitching specifically in honor of the festival, it is fortuitous that the project’s completion will coincide with Ganeshotsav or Ganesh Chaturthi. Ganesh Chaturthi is celebrated throughout India, although it holds special significance in western areas of the country, including Maharashtra, the state in which we live. Lord Ganesh is venerated at the time of his rebirth. He is beloved as the patron of arts and sciences, who watches over the good beginnings of any venture. As I mentioned before, Ganeshji is a daily presence in life here. His images protect almost every vehicle on the road, and guard the front door of most homes. His shrines are everywhere. In spite of this ubiquity, the festival itself is not all that ancient, becoming popular as a protest movement in the 1890s. It was revived as a unifying, mass assembly of people for a very public celebration, in opposition to anti-gathering laws in place during the British rule of India. Modern celebrations include the erection of decorated avenues and temporary platforms, on which images are displayed. These festival areas are also the center of both scheduled and street performances – everything from music and theatrics to impromptu dancing. During the festival, offerings and devotions are also performed at the platforms (pandals). You can see signs of the upcoming festival now all over Pune, with street constructions sprouting in neighborhoods, near temples and shrines, and along commercial streets, as civic, religious or community affinity groups try to put on the most beautiful and elaborate display. Some of the modern displays and performances are dedicated to additional causes, especially those of social justice. Families make (or buy) special delicacies for the celebration and reunite to enjoy the time together. Devotions culminate at the end of the holy week with huge processions, in which the images are escorted to bodies of running water, where they are immersed and destroyed, in a ritual that echoes the impermanence of the universe – be it of gods or men. This ritual immersion presents a number of logistical and environmental problems. Many of the images are crafted from plaster of Paris, and are decorated with paints containing heavy metals. The sheer number of these can produce major pollution events, and can leave toxic residues in the bodies of water used. There is growing awareness of this problem, even among the most traditional of the devout. Clay, as opposed to plaster of Paris statues are more widely sold, albeit at greater cost. Some people are making their own rather than buying them. There are even calls for volunteers to recover immersed floral offerings, similarly retired to the waters after the festival, in order to reduce the effects of a large biomass of decomposing vegetation. Logistical challenges include crowd safety, personal security, and fire awareness for unbelievably large throngs of people, all of whom are intent on getting the best view, having a good time, and enjoying the day and night time displays (complete with light shows and fireworks). There are also civic infrastructure challenges – in the cities, pandal construction damages the streets when holes for the supporting poles are drilled. Electricity for lights and loudspeakers is leeched off street poles, with improvised connections. And construction of the platforms and drapery-lined avenues can also be problematic, with enthusiasm often outstripping engineering for the anticipated loads or required clearances. Still, for all of the challenges, the city is poised for what looks like it will be a major celebration. I’m hoping we can experience some of the edges of the festival, and come back with memories and pictures to post here. You did all of this in 4 days? My Mind is Boggled. Gorgeous! The red blackwork you’ve done is so rich in history….it’s beautiful.